Have you ever made low carb crispy baked zucchini fries? If you haven’t… oh my gosh, you need to. They are a much healthier alternative when you’re craving French fries. Why Make Oven Baked Zucchini Fries? Maybe I’m a bit biased about how excited I am about these Parmesan zucchini fries, but I’m pretty sure it’s more than the fact that I’ve been missing “real food” over this past week. My husband and I just got back from a wonderful beach retreat. It felt amazing to just relax! The food was quite good, but as is usually the case in a primarily buffet setting, it was extremely bland to account for varying palates. For the reason of food alone, I admit I was a bit excited to get back. Who knew one could miss even the basics so much? Seriously, it’s like they don’t even put salt and pepper on anything. Needless to say, sprinkling them on food after it’s done cooking is not even remotely the same. Not to mention other spices. My spice rack was a nice, warm welcome back home. The other thing I missed? Parmesan cheese! For some reason the only cheeses they had were bland and mushy. Who wants that? I knew I had to immediately incorporate a rich Parmesan into a new oven baked zucchini fries recipe. I have to admit, I had another motive for making baked Parmesan zucchini fries. I was craving something that felt like junk food, but was still healthy. Even though I post lots of recipes, my usual staples are actually very simple meat, veggies and eggs. Although I make exceptions when I’m somewhere special (like Paris! ), on most vacations I order the same kind of thing. And since they usually can’t make things low carb, I don’t get to have things like fries. So when we got home from our trip, I wanted to make some low carb French fries! Zucchini was a perfect way to do it. That means it was pretty much effortless to make these zucchini fries low carb. All I had to do was use low carb breading, which was super easy to do by using Parmesan. Don’t worry, though. 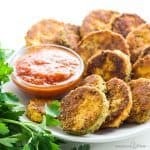 Even though these are low carb zucchini fries, they taste delicious! My whole family loved them, including my 11-month-old daughter. Slicing zucchini fries is super easy. Cut your zucchini in half lengthwise, then cut each half lengthwise again. Keep repeating cutting lengthwise until you get thin enough pieces. Once the pieces are narrow enough, just stack them and cut them across to get the length you want your baked zucchini fries to end up. You can check the video below to see what the pieces look like before breading them. As I mentioned in my last post, I know summer squash isn’t exactly in season right now. But, my local Costco still has a fresh batch, so I’m taking advantage while I can. I’ll happily make a simple zucchini noodles recipe and these baked zucchini fries over and over. For the zucchini fries recipe, I got the zucchini extra crispy by breading it in Parmesan cheese mixed with garlic powder and black pepper. Then, the broiler finished it off to make it crispy. It’s the best kind of coating I’ve tried so far! It’s easy to find and always around in your pantry. So, you can make oven baked zucchini fries on a whim! The coating gets crispy in the oven, which is fantastic. Who wouldn’t love crispy zucchini fries? The Parmesan cheese flavor is to die for. It reduces the need for spices. If that wasn’t reason enough to make this zucchini fries recipe, I can’t go without mentioning how incredibly simple it is. You need just five ingredients! You might even have them on hand right now. If yours is “wet”, it will have a harder time crisping up. Pat dry with paper towels if needed. Use smaller zucchini if possible. The larger the zucchini, the higher the moisture content. Do not salt the zucchini fries. I’ve tried a recommendation that involved salting the zucchini over the sink to drain some of the water before baking. I don’t recommend this, as the result was too salty and more mushy than crispy. You can place the Parmesan zucchini fries under the broiler to crisp up at the end. Lightly pan fry if you’d like. To make the low carb zucchini fries even more crispy after baking, you can lightly pan fry them. If you want crispy zucchini fries, it’s truly best to eat them fresh. But if you must store them, do so in the fridge layered with paper towels between them. They will get soggy, so you’ll likely need to pan fry them if you want them crispy again. You can freeze zucchini fries. Just make sure to bake them first. After baking, place onto a parchment lined baking sheet and freeze until solid, then transfer to a freezer bag. To serve frozen zucchini fries, do not thaw them. Place them straight into the oven until hot and crispy. If needed, you can lightly pan fry to crisp up more. My favorite dipping sauce for these low carb baked zucchini fries is organic marinara. Parmesan cheese and tomato sauce are such a classic combination. Can’t go wrong with that. I also think they are awesome with Dijon mustard, but maybe that’s just me. Any dipping sauce works, really. Everything is better with dipping sauce! 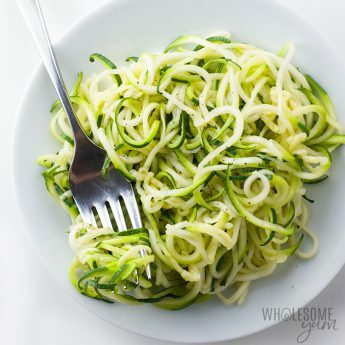 And since there aren’t a lot of carbs in zucchini, you totally have room for a sauce even if you’re trying to be low carb. That being said, these Parmesan zucchini fries are so good that the dipping sauce is totally optional. 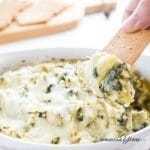 The cheese and garlic powder provide so much flavor that nothing else is needed. But if you like a creamier sauce, I think these go perfectly with my spicy appetizer dipping sauce, or keto ranch dressing, too. How do you like your low carb zucchini fries? Plain or dipped in a sauce? Let me know! And if you’re not sure how to make crispy baked zucchini fries, don’t worry. It’s so easy! All the instructions are on the recipe card below, plus scroll down for the VIDEO! 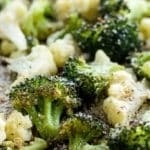 Baking sheet – I love this one because it doesn’t stick and I get more crispy zucchini fries than using parchment paper. And, the non-stick coating is PTFE-free, PFOA-free and BPA-free. Chef’s knife – A good knife is a must in the kitchen, and makes it effortless to cut the zucchini. White bowls – This set is the perfect size for dredging and dipping. Cut each zucchini in half lengthwise 4 times (to make eight long sticks from each squash). Then cut the sticks once crosswise, making 16 sticks from each squash, approximately 4 in (10 cm) long and 1/2 in (1 cm) thick. If the zucchini sticks feel "wet", pat them dry with paper towels. Prepare two shallow bowls - one with beaten egg and one with a mixture of grated parmesan cheese, garlic powder, and black pepper. Dip each squash stick in the egg, shake off the excess, then press into the parmesan mixture, coating all sides. (Use one hand for the egg and the other for the parmesan, to avoid getting too much egg in the parmesan which will make it clumpy.) Place on the prepared baking sheet in a single layer without touching. Click or tap on the image below to play the video. It's the easiest way to learn how to make Baked Zucchini Fries! Wow! So freaking good! I loved them! What a great recipe! I’m so glad I discovered your website! Thanks! Thank you SO very much for all your hard work to make things so easy for all of us. I have an immune disease and have to focus on reducing inflammation in the body. These Keto recipes help doing this! Have you tried this recipe in an air fryer? Hi Lisa, I haven’t but readers told me they have and liked it. Hi Sharon, No, it’s not recommended to freeze these. They will be soggy. oh my… 8 months now on Keto…. I was missing french fries…. this is great. 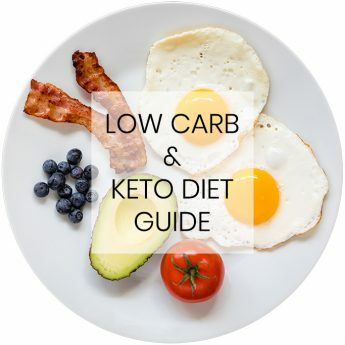 Why is it no one who shares keto recipes, well there are a few websites that do, tell us how much is a serving size?? My hubby and I look at recipes, but there is no serving size. I understand that per the nutrition information is per serving. But how much is a serving…. 1/2 cup, 1 cup, 2 cup? It’s great to share recipes, but it’s to difficult for me to know how much a serving is. I find wonderful dinner recipes, but know one tells us how much a serving is. Just what it yields and the nutrition information. Thank you for this recipe, I’m going to make these, but cut extremely thin and make a chip. Hi Cherie, Every single one of my recipes lists the serving size. 🙂 You’ll find it on the recipe card above, in the Recipe Notes section. Yum! These zucchini fries are incredible, especially with that cheesy coating! I love how easily they come together. That’s a great alternative to French fries. This is a huge hit in my house. These are just awesome!! Way better than regular fries, if you ask me! I love that there are parmesan and garlic powder on them, too! These crispy zucchini parmesan fries will be perfect in helping me eat healthier this new year. These look SO delicious! I love that they’re made with zucchini but still have that indulgent taste to them. Thanks for sharing! Your nutrition facts is the serving size the whole recipe or 1 zucchini? Hi Chantelle, The nutrition info is per serving. The serving size is in the recipe notes above. They were delicious, my whole family loved them. Baked perfectly in my toaster oven. Baked ten minutes on the bottom rack and then moved it to the top rack to bake for the last ten minutes. Thank you for sharing, Esther! Love the idea of making them in the toaster oven. I’m all for saving carbs and substituting zucchini fries for potato fries. These look perfectly breaded. I can’t wait to make your recipe! I love zucchini and have had zucchini chips before and loved it. 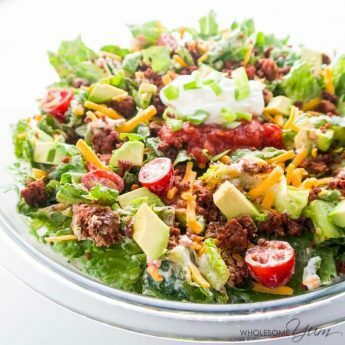 This recipe is even better because it is low carb! These zucchini fries sound delicious! I love how crispy they look on the outside but soft inside. Can’t wait to make them. I hope you like them, Kate! These parm zucchin fries sounds so yummy and look crispy! I’m not sure I would share a batch!! Hi, I made these tonight. The parm batter was crispy kind of, but the zucchini was totally mush to bite. I even left it in the oven at 200 for maybe an hr. Hoping it would dry out a bit. Hi Michelle, Everyone’s oven is a bit different and it sounds like they were baked too long if they were mushy inside. 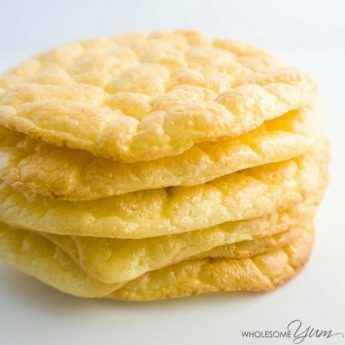 I made a batch of these for game day not telling anyone that they were low carb and everyone thought that they were FANtastic. Will now be a regular addition when we host any kind of get together. Thank you, Tim! I’m so glad everyone liked them! The cheese didn’t stick to the egg wash at all. Hi Jennifer, Sorry to hear you had this issue. Did you do everything the same as the recipe card, and check the video? It’s hard to say what went wrong without being in the kitchen with you. My guess would be that your zucchini might have been “wet”, which makes the egg wash not stick well and therefore the cheese too. You can try patting dry first next time. These were absolutely delicious!!! We did fry ours in coconut oil to add some healthy fat. Which made these amazing. 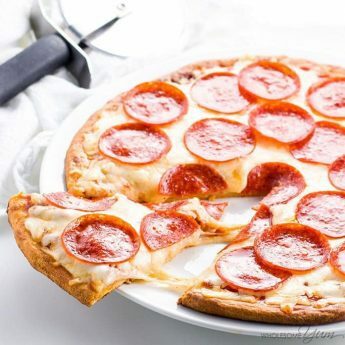 This recipe will be a regular addition to our Keto diet. These are a must try!!! I am so happy you liked the zucchini fries, Jennifer! Please come back soon! I don’t care for Parmesan cheese. I’m not sure if you could use another kind of cheese. What do you think would be a good substitute? Hi Amelia, It would need to be another very hard cheese, like Pecorino Romano. My husband says hands down best way to eat zucchini. The second time I made them I made one change: salted the zucchini for 30 minutes then patted them dry. Much less watery. Thank you so much for sharing, Sue! I’ll need to try that! Delicious! Quick, easy prep. The control on my oven just went out and I couldn’t use the broil function, so I just turned off the oven after 20 minutes and baked them a couple more minutes. Even without broiling to finish them off, they were crispy and delicious. My husband loved them. I served them with organic marinara and that was delicious. I think ranch would be great, too. I also looked up your spicy appetizer sauce and will make it in the future when I have more time. Husband is diabetic, so I am always searching for reduced-carb recipes. It’s especially hard to find recipes for crispy, crunchy foods. I wonder if larger zucchini would work for those who said theirs was soggy since they tend to be drier. This recipe is definitely a keeper! I’m so glad they still worked for you, Penny. We love them with the spicy appetizer sauce – hope you’ll try it. THANK YOU!! It was delicious, every one was fighting over them. Especially my parents. Yay, that’s great to hear, Breanna! Hi! Love these! I mixed a little half and half with my eggs to them less thick. I also added onion powder to cheese and used chipotle black pepper in place of black pepper. I breaded the zucchini by placing Parmesan mixture in a zip top back. Baked very crispy on parchment and no sticking. Will definitely try again! Thanks! I’m so glad you love them, Cherie! Those spices sound delicious to add. Great idea to bread the zucchini by shaking in a bag. I a so happy you liked them, Amy! Please come back again soon! Couldn’t get parm mix to stick to zucchini so I ended up sprinkling it on top on cookie sheet. Added some Italian seasoning, red pepper, garlic powder, too. Hi Elmira, I have some tips about this in the post above the recipe card. Make sure you are using different hands, so that you try to minimize touching the dry mixture with wet hands covered in egg. How many in a serving or are you calling 1 medium zucchini a serving? Hi Linda, It’s 8 fries in a serving. I hope you love it, Rhonda! Sounds good! Can I serve the next day too without having to heat them up? Hi Nati, These are best fresh. They get soggy after you store them. Mine were soft and not sure why. I wanted them crispier. Hi Teresa, Try placing them under the broiler at the end. I updated the instructions to include this step. I love zucchini and am always looking for new ways to eat it. I can not wait to try these. I’m hoping I’ll be able to get my boys to try them since they look like fries. They turned out great! I subbed cotija for Parmesan (I use them interchangeably in most recipes). I think using parchment is key—no sticking, and easy cleanup. Delicious with keto ranch and my keto oven bbq chicken. Thanks for a keeper recipe. Thank you for sharing with us, Elizabeth! I just tried this tonight and OMG, they were amazing and so simple! 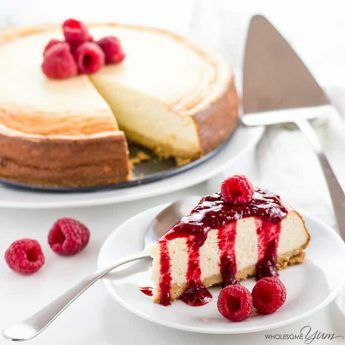 Thank you so very much for this great receipe!!! Im sure i will find more just like this on your website! I am so happy to hear that, Melissa! Thanks for stopping by! I made the Zucchini Fries today and they were good, but they didn’t brown like yours on the video. You turned them 1/2 way through the cooking period and they were brown on the bottom. I started to turn mine 1/2 way through and although the tops were beginning to brown (unlike yours), the bottoms were wet and completely unbrown. The parchment paper seemed wet. I cooked them longer… about 25-30 minutes and they were somewhat browned, and tasted good, but they weren’t really crispy… a little limp. What do think caused this difference? BTW, the flourless chocolate cake is to die for!! Hi Diane, It might be that your oven runs a little cooler than mine, since you needed to cook them for longer to get them to brown, OR your zucchini pieces were bigger. Try increasing the temp a bit next time. 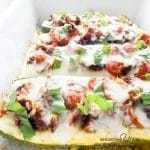 Another possibility is you had particularly “wet” zucchini; you can pat them dry a bit before coating if they feel damp. Finally, I added a step to place them under the broiler at the end, so that should help with the crispiness. These are great! My husband really liked them too. That makes them double great! We like spicy food, so I mixed Cajun seasoning in with the parmesan cheese. Using parchment paper and flipping them is the secret to them turning out crispy. Thanks for thiś recipe! I am so happy you and your husband liked them, Gaye! Thanks for stopping by! How can these have 21 g of protein? Hi Pam, The protein comes from the eggs and parmesan cheese. These recipes are wonderful. Thank you. So, First of all they tasted delicious! But mine sort of turned out more like zucchini cheese scramble lol. I did grease the tinfoil really really really good but the zucchini just stuck right to the tin foil. I couldn’t flip them. They were pretty soft, I’m guessing because I didn’t turn them halfway through. Also, I can’t have garlic bc I have IBS and garlic is an irritant. I skipped the powder but do you think some sort of powder is necessary to help with the crust? Do you have any other methods for getting the fries crispy? Thank you, Roe! I’m glad they were delicious despite the flipping issues. I think that was definitely the biggest reason they weren’t crispy. Using parchment paper next time can help if they still stick for you using greased foil. The garlic powder isn’t necessary so you can definitely skip it! Awesome perfect snack. I chose a low carb spicy marinara to dip. Delicious! Thank you, Rhonda! 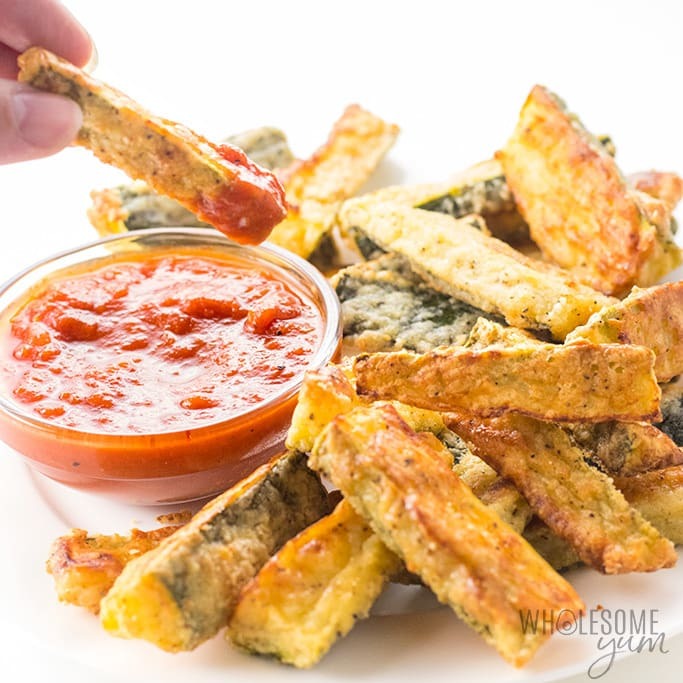 Love these zucchini fries with marinara. I made these with dairy free cheese and they turned out great! Slightly different flavor than when I made them with regular parmesan, but still delicious! Good to know! Thank you, Megan! I hope you like them all, Barbara! Thanks for stopping by! In the oven now. I used garlic salt and onion powder on mine. Cannot wait try these! Thank you, Jill! I like to add those, too. Would it work to substitute yellow squash in this recipe? Hi Rebecca, I haven’t tried it but it would probably work. Let me know how it goes if you do! In the video it appears that you use partchment paper…if that is true it would be nice if the recipe were to reflect that. As other comments have said these stick to a commercial non stick pan. I will try one more time with parchment paper but I am not optimistic. Hi Travis, The recipe card originally stated to line the pan, so it was never recommended to place the fries directly on a non-stick pan. I added to the recipe card that parchment paper works best, though foil might be okay if you grease it very well. I always use parchment paper when making these fries and they never stick. Hope you like them! Hi Michele, Yes, that sounds like a great idea! I have been eating low carb for a month now and there are not very many veggies that I care for (including zucchini). But they looked so good I thought I would try these tonight. I made them for me and my husband. They were delicious! And so easy to make! My husband loved them too! Makes me very happy because I needed to add more vegetables to my low carb diet and these definitely do the trick! Thanks so much! You’re welcome, Holly! I’m glad you and your husband enjoyed these. These were a nightmare to make and were no better than when I just saute squash. What a waste of my time and expensive Parmesan cheese! Hi Mari, Sorry to hear that they weren’t for you. What was difficult about making them? I have a video posted above the recipe card and it’s pretty straightforward. Other than that, I find them different from sauteed squash and have gotten the same feedback from others. If you prefer pan frying, you could try this fried zucchini and squash recipe instead, which is even more crispy. This looks tasty and interesting. Have you tried, or do you think that, using an air fryer would work for this? Hi Jaygee, I don’t have an air fryer so haven’t tried it or had experience with it unfortunately. I don’t see any reason for it not to work, though. I’d love to hear how it goes if you try it! My fries stuck to the baking foil even after I put some grease on it. How can you prevent this from happening? Hi Hanya, You might need to grease it more generously if using foil. Another option would be to use parchment paper. Or, you could use these non-stick pans – they are truly non-stick and easy to clean even without lining them. Could you fry these? Are they really crispy baked like this? Hi Lisa, Yes, frying them should work too. I haven’t tried it, but they will likely be even more crispy that way. (Let me know how it goes if you give it a shot.) Otherwise, the fries do come out crispy right out of the oven, and you could put them under the broiler for a minute or two to crisp up more. But, they do lose their crispiness if you let them sit for a while, so they’re best eaten right away. Wow! I made these tonight and they will definitely be a new go-to side for me! So easy and delicious! Thank you, Kaylyn! They’re a go-to side for me, too. So the parmesan cheese, you get it out of the bottle like you would use on spaghetti? Could you use the bagged kind that’s with the cheese in the store? Hi Ariel, I use this parmesan cheese. Any finely grated parmesan will do – it doesn’t matter what container it comes in or if you want to grate it yourself. The only bagged kind I’ve seen is shredded, not grated, though. I used freshly grated Parmesan and they turned out great!!! Will definitely make again and again! Silly question, but did you use fresh parm here or the canned stuff? I never use the canned stuff, but I think here it might coat better? Hi Michele, I used the kind from a can but either one should work as long as it’s finely grated. Let me know how it turns out if you try the fresh kind. Just made a batch of these and they are delicious!!! I dip mine in ranch. Oh my goodness…I know what I’m doing with my zucchini this week! Yum! Thank you so much, Kalyn! I appreciate the share! I have one of your recipes in an upcoming roundup I’m doing, too. Is just one zucchini “fry” a serving? Hi Kathy, I wouldn’t consider one fry to be a serving (that’s a crazy tiny serving! ), but that is how the nutrition info was listed initially. I changed it to be more reasonable – 4 servings in the recipe, 8 fries per serving. Thank you for pointing that out! My girls would love these! Super fun! Thank you, Renee! Yes, zucchini fries are such a great way to help kids get their veggies in. My daughter loves them!